Wondering about saving at Nordstrom Rack? Nordstrom is America’s favorite fashion retailer that has been helping men, women, and children look their best for more than a century. They started from a small Seattle shoe shop in 1901 and grew into a 349-store retail colossus that works in 40 states, Canada, and Puerto Rico. This post has been sponsored. This post contains affiliate links, and I will receive compensation if you make a purchase after clicking on my links. In 1973, they opened the first Nordstrom Rack as a clearance outlet for the full-line stores that offered customers an opportunity to shop for brand name items at significantly discounted prices. This off-price retail division became so popular that today, there are 215 Nordstrom Racks and only 123 full-line stores. Nordstrom Rack offers branded clothing and accessories for men, women, and kids for 30%-70% of their original price, which makes it a one-stop destination where style meets savings. However, there are even more ways to save money at Nordstrom Rack, and we are here to explore them all. Signing up for one of the three Nordstrom cards is the best way to save money. 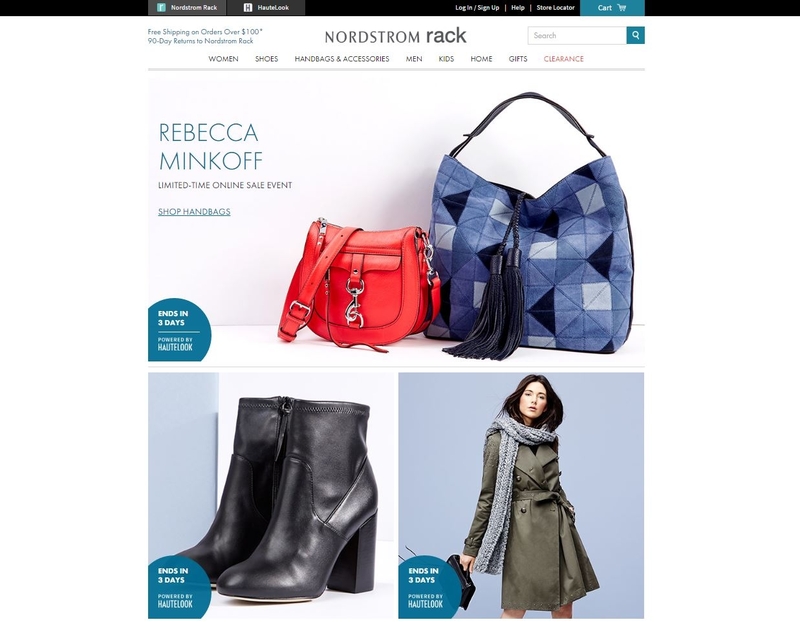 Once you sign up and spend $100 at Nordstrom Rack, Nordstrom, HauteLook, or Trunk Club, you’ll receive a $20 bonus in the form of a “Nordstrom Note,” which you can spend in their store or on their website. Once you earn 2,000 points, you’ll receive $20 that you can spend online or in store. In addition, Nordstrom has special bonus points events, which include double and triple points days, where you can earn more points per dollar spent (you can earn 6 points per dollar spent during Triple Points days). And the best part is that cardholders can schedule their own personal triple point days. If you hate the idea of having a Nordstrom card, then simply sign up for Nordstrom Rewards. As a rewards member, you get one point for every dollar spent at Nordstrom Rack, Nordstrom, or HauteLook. The principle is the same, so once you collect 2,000 points, you also receive $20 in a form of Nordstrom Note that you can spend in the store (or on their website). We recommend signing up for a Nordstrom card instead, as you simply have more benefits. Before shopping at Nordstrom Rack, you should always look for coupons that can reduce the already reduced price. Of course, the best way to find coupons is to use our website that always offers amazing coupons and special discounts. 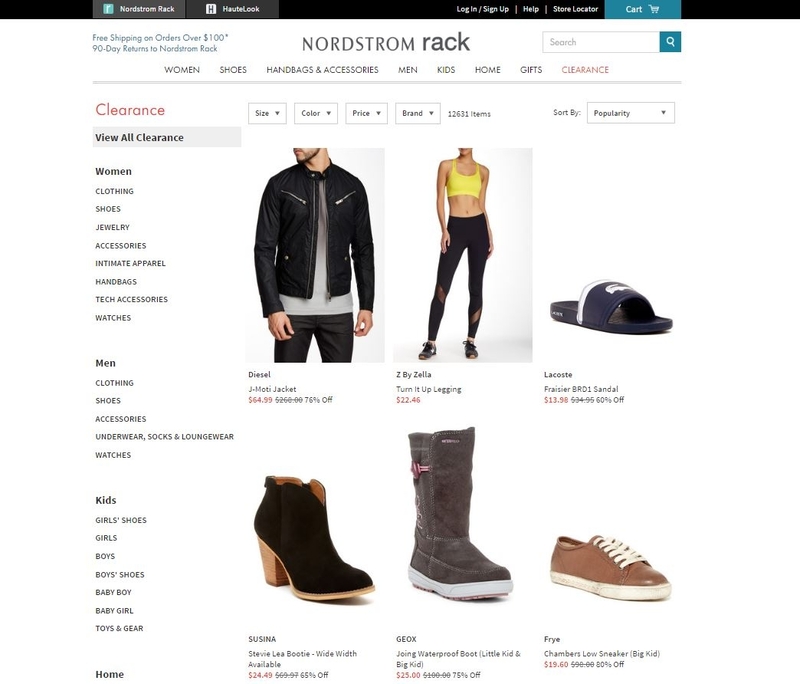 All you have to do is type “Nordstrom Rack” in the search box at the top of our page and find the right coupon. In addition, you can shop through Ebates and get a percentage back from your purchase. Just don’t forget to use your coupon code when checking out to reduce the price. If you are new to couponing, make sure to read our Couponing 101 guide. If you really want to save money at Nordstrom Rack, you need to shop during “Clear the Rack” sales that happen around 12 times per year. These sales offer 25% discounts on already reduced items, which means you’ll save a ton of money. For example, we noticed a designer jacket with an original price of $300. Once it went to Nordstrom Rack, the price was reduced to $45, and thanks to the 25% discount during a “Clear the Rack” sale, that same jacket was around $34, which is around 10% of the original price. Now that’s what we call saving money! And in case you are wondering, the next “Clear the Rack” sale will be from February 17th through February 20th. It goes without saying that we strongly recommend shopping during that period. By subscribing to Nordstrom’s newsletter, you’ll receive updates about special offers and private invites to shop before others. In addition, they often send special discounts or Nordstrom Notes. 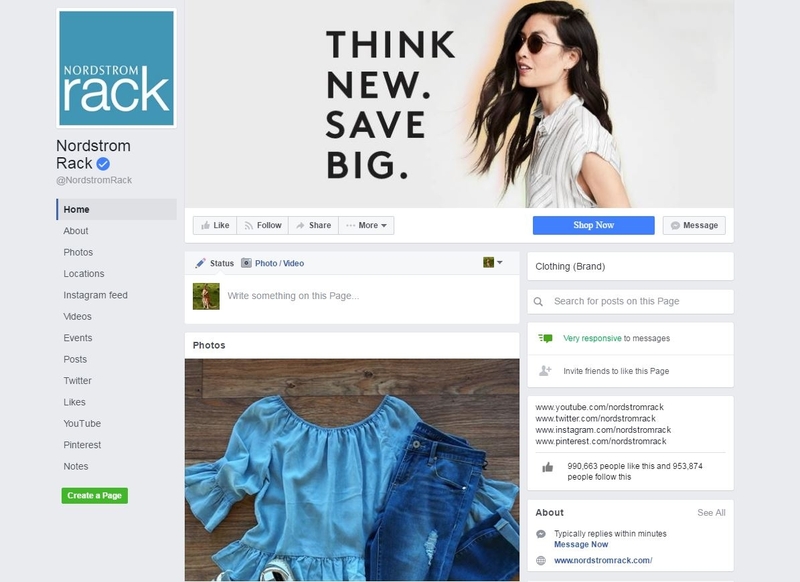 Another great way to find out about sales, coupons, and discounts is to follow the Nordstrom Facebook page. They often inform their followers about special freebies that take place on Saturday morning while supplies last. There’s no telling what you can get for free, so make sure to visit their Facebook page frequently. Once you go shopping, bring your friend along and take advantage of their referral program – you get $20 when a friend opens a debit or credit account. Most people have no idea that some items at Nordstrom Rack are not from Nordstrom at all. In fact, there are items purchased specifically for the Nordstrom Rack stores. Brands that are purchased for the Rack include Splendid, Calvin Klein, Daniel Rainn, Vince Camuto, and True Religion. Nordstrom is known for buying items made in the USA, and as a result, many items get shipped to Nordstrom Rack shops where you can purchase them at a reduced price. AG, Alberto Makali, Free People, Gibson, Karen Kane, NYDJ, Munro, Eileen Fisher, PAIGE, and Zella are just some of the US brands you can find at Rack stores. Finding something we absolutely love and must have, only to learn that the store doesn’t have our size, is a shopping nightmare. But that’s not going to happen when you shop at Nordstrom. If you find something and they don’t have your size, simply ask a sales associate to locate it in another store. Then, you have the option to pick it up yourself (if the store is near) or simply ask them to send the item to your house. However, shipping will cost you around $8 (the exact cost depends on the item). Knowing when you have your hands on a $0.01 item is near impossible, since the price isn’t marked on the tag. The exact price will only come up when scanned at the register. Therefore, do not try to find such an item and consider it as a bonus if you happen to purchase it. Not many people know that you can request alterations right in the store. If you find something you like, but it doesn’t fit you perfectly, you can have it altered right away. However, this service is not free and you’ll have to pay for it. Nordstrom Rack is truly a one-stop destination for purchasing high-quality, brand-name clothing and accessories for men, women, and kids at 30%-70% of their original price. Therefore, it comes as no surprise that new merchandise arrives daily and disappears quickly. So if you want to save money at Nordstrom Rack and get the best deals, make sure to apply the above-mentioned tips. Dealspotr posted this article on the Dealspotr blog. See @editor’s blog at https://dealspotr.com/blog.This post originally appeared on the Dealspotr blog. Dealspotr is the most accurate coupon site that pays you to save. I’m @ellenblogs on Dealspotr, use my link to join today and earn 5,000 bonus points. I haven’t been to Nordstrom in a while, these are great tips! I love Nordstrom Rack – they have such great deals!